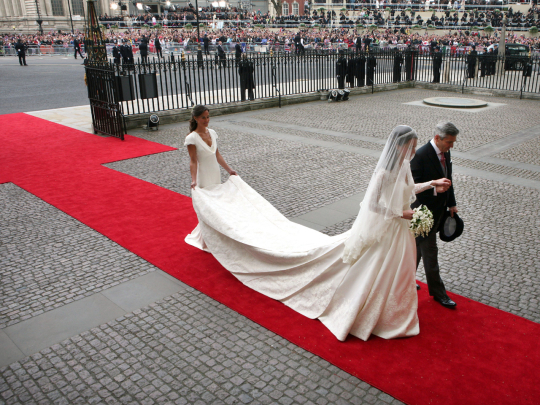 On a three way call with my mom and sister, Gail, early on April 29th, 2011, we caught the first glimpses of Kate Middleton as she stepped out of a car and onto the grounds of Westminster Abbey. "Here she comes," I remember shouting, with a gasp over the loveliness of her dress emanating from my lips soon after. "She looks like Grace Kelly," my mom whispered. We all agreed: the dress was perfect for the future (and now) princess. The dress designer is Sarah Burton for Alexander McQueen's fashion house. You may remember that Alexander McQueen committed suicide in February 2010 at the age of 40. It's sad to think he was not here to see this day! When speculating over whom might design Kate's dress, I had no doubt about one thing: the designer would be British. On such a special occassion for her country, I couldn't imagine Kate going with a foreign dress designer... and I was right. Ms. Burton is British. I also love that she chose a woman. Kate is the first royal bride to have a college degree, and to me she seems modern, feminine, elegant and refined. Her dress evoked all these characteristics. 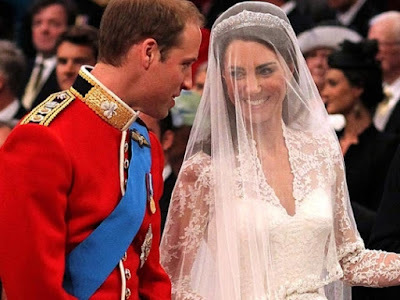 "Miss Middleton chose British brand Alexander McQueen for the beauty of its craftsmanship and its respect for traditional workmanship and the technical construction of clothing," the palace said in a statement regarding Kate Middleton's wedding dress (statement courtesy of CBS News). A bride never wants to look back at her dress 30 years later and mutter, "What was I thinking?" My mom, for example, who married in the 1970s, chose a dress that was classic. If you saw just the dress, I don't think you could pinpoint the exact decade it was made. Her hair and bridesmaid dresses (a horrible green) gave her away, of course, but the dress: beautiful. 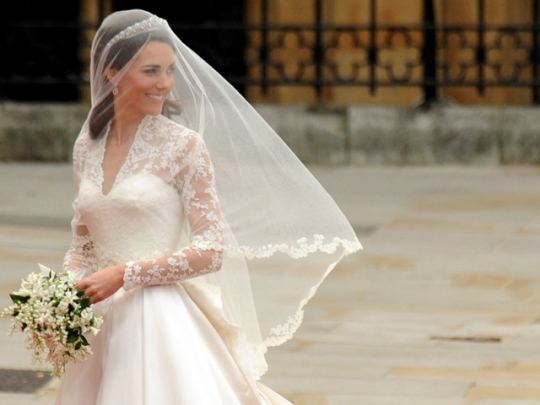 Lace is timeless, and since she had to be mainly covered up to marry in the church, I think the look was just perfection. That deep v in the lace gives a hint of sexuality, too. You can see all the detail and work that went into just the bodice, and supposedly the dress cost around $83,000. I'm not surprised. It is just gorgeous. I love the lace around the edges and the train as well. She didn't overdo the sparkle, leaving that instead to her jewelry: the Cartier tiara and drop earrings, a gift from her parents. Her makeup was also very natural and not over-the-top. She looked like herself. And I don't think anyone doubted she would wear her hair down. She has such beautiful brunette locks. I always love to see brunettes getting their due attention. Kate Middleton's dress is made from ivory and white satin gazar, and the bodice and skirt feature hand-cut English lace and French Chantilly lace. The train measures almost nine feet long. "Miss Middleton wished for her dress to combine tradition and modernity with the artistic vision that characterizes Alexander McQueen's work. Miss Middleton worked closely with Sarah Burton in formulating the design of her dress," the palace said in a statement regarding Kate Middleton's wedding dress." 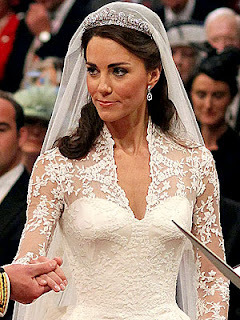 Kate Middleton's veil is made of layers of soft ivory silk tulle with a trim of hand-embroidered flowers. It is held in place by a Cartier "halo" tiara, lent to Middleton by Queen Elizabeth II. The tiara was presented to Princess Elizabeth (now the Queen) by her mother on her 18th birthday.